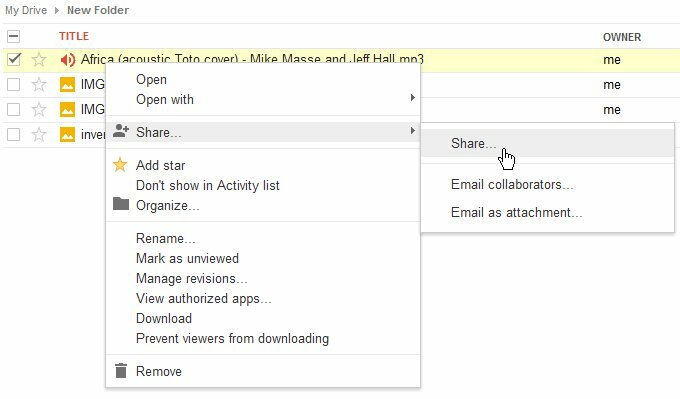 Create permalinks easily by browing your Google Drive files and folders. Just click the button below to connect. As the popularity of gdURL grows, it is becoming increasingly difficult for our server to keep up with demand. Your support would be greatly appreciated and will help prevent this service from having to shut down! Yes! You are provided multiple versions of your permalink. For each method, we track every time the link is used by anyone. In addition to a direct link to any file and the ability to display any image on a web page (in an <IMG> tag), you are also provided special codes that you can use to embed supported file types (such as .PDF and even .ZIP) in a fancy file viewer on any web page. Will an HTML page work? Not anymore. As of March 3, 2015, HTML files are no longer acceptable due to filthy scumbag spammers using them maliciously. They always have to ruin the party for everybody. 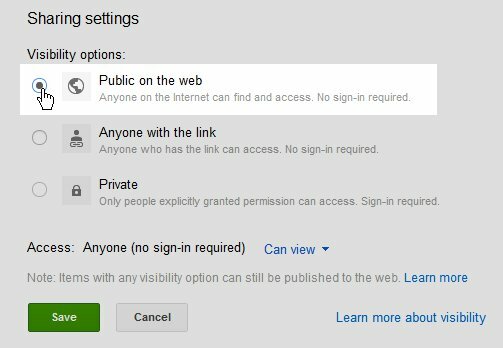 How do I find a file's public URL in Google Drive? Right-click on the desired file. In the pop-up menu hover over Share... and click Share... in the sub-menu. 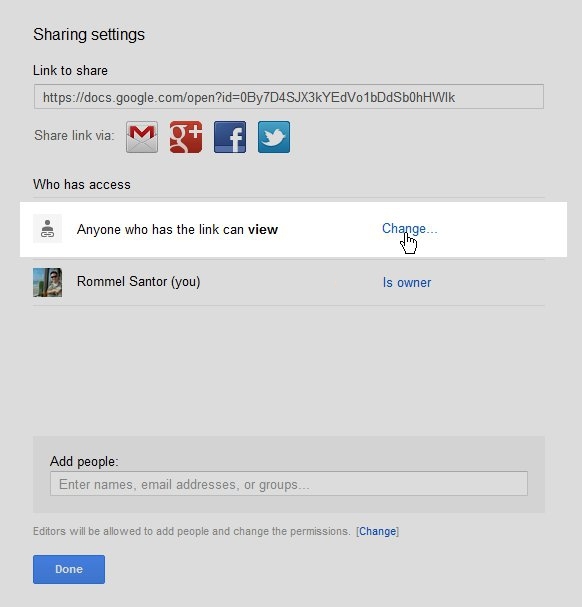 The Sharing settings form appears. Click Change... in the Who has access section. The Visibility options form appears. Select the Public on the web option and click the Save button. You are returned to the Sharing settings form. Copy the Link to share URL to your clipboard and paste it here at gdURL.com. That's it! Sorry, not any longer. They used to be permitted because it was assumed that Google would not allow its users to submit viruses to the Drive service, however some malicious users have proven that to be an incorrect assumption. Thus, executable applications are no longer accepted by gdURL.com. Can I link to a folder? Sorry, that's not supported. You can only create a permalink for individual files and not folders. Please refer to our DMCA Take-Down Policy page. In short, no. Any valid DMCA take-down request will result in the offending link being deleted. I created an image link. Why won't it load? If your image is very large in size (the exact minimum is unclear), Google cannot scan it for viruses, and when you open the file via a web browser, Drive will display a page with a warning message instead of the actual image itself. What's up with the all the ads?! I know ads are annoying, but servers are expensive, so it's just an attempt to get some help paying the bills from the loyal gdURL users who appreciate the service. (In all honesty, the ads you see here haven't even generated enough revenue to earn a single payout from Google.) You could also help by donating. Thanks for your support and appreciation! Are there any potential disadvantages? The only real problem with sharing links at Google Drive files in general (whether via gdURL or directly from Drive) is that Google limits the amount of traffic to your files. Once too much bandwidth or too many views have occurred for a file, Google will stop allowing people to load it temporarily. Google Drive provides online storage for all your data. 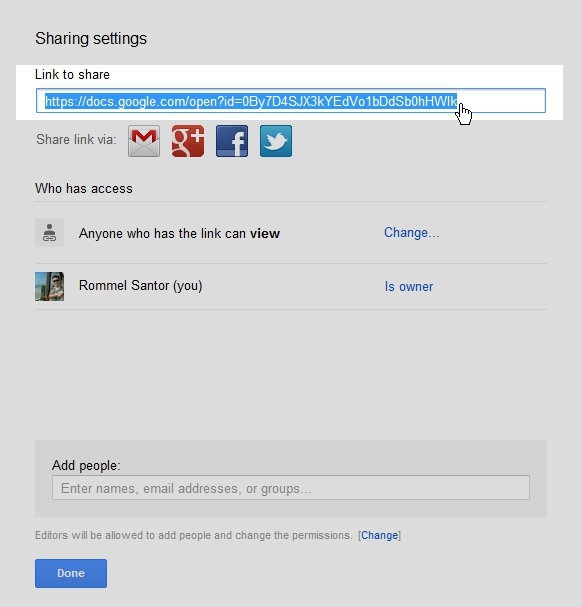 Google allows you to share your files via email by providing a special link, but to properly embed your file on a website or in an IMG tag, you need a direct and permanent link to your file. That's where gdURL.com comes to the rescue!